Working full time is actually quite natural in our society although most people do not understand how harmful it can be to our bodies. Working full time comes with a large number of problems. It makes you so busy that you aren’t able to make time for your family and friends. Not only that, you become a very unhappy person and aren’t able to do your best as you are expected. So what should you do? 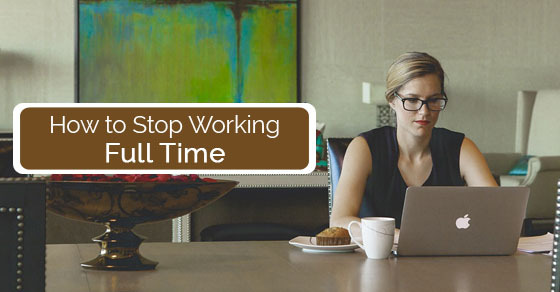 Working part time is actually a good solution and in this article we will tell you why it is not a good idea to work full time and how you can stop it! Why part time working is better than full time? The good part about working part time is that you will have all the time in the world for your friends and family. You can work in the morning and afternoon and spend time with significant others towards the evening. The best part is that you will be able to pursue your dreams and passions, something that you surely are not able to do when you are working full time. You should look for part time jobs that pay well and start working early if you are getting paid by the hour. When most people are working full time or if they are working 8 hours a day, it does a lot of wrong to them. Not only does it make you a less creative person but also makes you lose your balance. You become someone who is less fun since you are swamped with so many assignments. If you want to boost your creativity once again, you have to work a little less and the best way to do that is by working part time. It is always better to do two part time jobs instead of one full time jobs. Yes, this could sound like a full time thing but there are chances that you will have more control over the hours in that way. If you want work to be flexible, you should try freelancing during the off hours. The point is that there is nothing better to do than waking up for a cup of coffee, doing some work and then getting on to your real work. You could actually end up getting paid a lot more. A great thing you can always do when you are working part time is that you will have enough time to do networking. You will have more time to meet other people, hang out with them more often, spend time with people who can help your career and what not. Networking is always a fun thing to do. It helps people to better with their lives. So you should definitely give it a shot! When it comes to a part time gig, you are to be valued, but that does not mean you are expected to be loyal all the time, especially what the full time workers are expected to be. It could means that you have probably been able to afford the option to ask if some time off can be given to you. Plus if you are working in an office, you will surely be able to get some more cash. This will give you some more training which can often fetch you more cash. It is all about how you do your work. Why you should never take up a full time job? There is no need to work 45 hours every week. Nobody really needs to work that long. If you can work for fewer number of hours without having to reduce the income, then it would be a smarter thing to do. You don’t need to have a specific number every week. You will also need a certain amount of income to keep living on. And of course there will be ways in which you can hit the target without having to work hours after hours. A simple solution to your problem would be creating income streams that are semi passive, becoming a boss of your own company and setting your own amount and getting well paid for jobs that have fewer working hours. Working full time always means that you won’t be able to have fun with the money that you earn. But in some way or the other, the amount will still get well spent. Always remember that your income will have to be of a specific amount. Knowing the kind of choice you have, you will definitely be able to cut down some of your expenses. If you avoid working full time, it will become a better monitor that will help you in budget hacking like anyone else. You might even end up saving more money if you work part time. You will become a healthier person when you stop working full time. You will be able to work for shorter hours, boost more flexibility and even end up making some time for exercise. People who tend to work lesser hours are always able to make time for themselves. They have a better immunity system, better digestive system and in fact are able to live a better life. People tend to be stress free when they work less. That is enough reason to not pursue a full time job. It is always easy to grab a sandwich that is ready made or even a sweet snack whenever you are working but you really don’t realize often on how fast all these choices will add up to a huge pile of junky and other foods that are very bad for your health. Plus if you are someone who loves drinking coffee and soda, then it will be horrible for you as you will be working full time. The minute you get stressed you will want to eat and drink all the unhealthy foods in the world. When you are doing a part time job, you will have the time to prepare food that is healthy and fresh. You will be eating foods that are healthy and tasty and make better decisions. The good thing about working part time is that you will be full of energy. Since you will be spending a lot of time on your own, you will have a lot of energy. When people tend to work for longer hours, they don’t have much time for themselves as a result of which they are always tired and bummed. But that will not be your case because your body will always be more energized and happy. You will have enough time for all the fun things you want to do and that will keep you energized for sure. When people do part time jobs or those kinds of work where they are self employed, they will always have the time to learn new things. It will make your life much more awesome. Your brain in that way will be much less frazzled. If you are a lucky person, then doing a full time job will come with several training opportunities. In case you would like to learn something that is not included in their training courses, then you will surely be able to learn it when you have the time. Time is of course precious and rare, especially when you are working full time. So what you should do is stick to those jobs that are part time or those jobs where you will have things to learn every day… choose things that make your life awesome and interesting. Plus your brain tends to be less worked up when you work part time and in that way you can learn new things. A good thing about not working full time is that you will be able to pursue your passions. You will be able to go for that audition you have always wanted, spend more time on practising and enjoy yourself as well. A lot of people who need money and would like to pursue your passions at the same time often tend to do jobs that are not full time. You can also do the same. Another good thing is that you will get your freedom back. Like we have stated earlier, people who work part time are not entitled to be very loyal. So in that way you will be a free bird. Working part time comes with so many benefits, especially if you are doing two part time jobs per day. There will surely be something much more interesting to put in your CV. You will actually be able to make more money in that way and surely work your way up in the industry you have wanted. A great thing about working part time is that you tend to become a productive person. Spending little time on working will actually make you a better person. You will almost feel like you are on a vacation every day. You will have the time to enjoy all the things in the world, spend time with your friends and family, you will be able to work and focus better and in that way your life will improve. Finally you will always be able to achieve that work and life balance that you have always wanted and dreamt of. There are people who work part time in their homes on their laptops and get paid twice more than what you get by working throughout the day. These guys also know how to balance their lives without having to worry about a single thing. You should also do the same. Just look for all the right opportunities. I am sure you will be able to get what you want. Working throughout the day could certainly fetch you a lot of money but always remember that there are plenty of people just like you who are earning double the money by doing a different kind of job. You should in fact look for those jobs that are lucrative and ones that pay you better without slogging you all the time. There are many opportunities available. All you have to do is make use of it. Also if you have some ideas to share or feedback to give, drop a comment below. On that note , Good luck.